In 2009/10 there were 84 inward investment successes in the West Midlands and another four knowledge-based investments. These investments created over 1,500 new jobs and safeguarded another 4,300. Although these 88 investments represented the lowest number of jobs created or safeguarded since 1992/93, they also represented the 7th highest total number of projects since 1991. Inward investment is usually spread reasonably evenly between the West Midlands metropolitan areas and the shire counties. 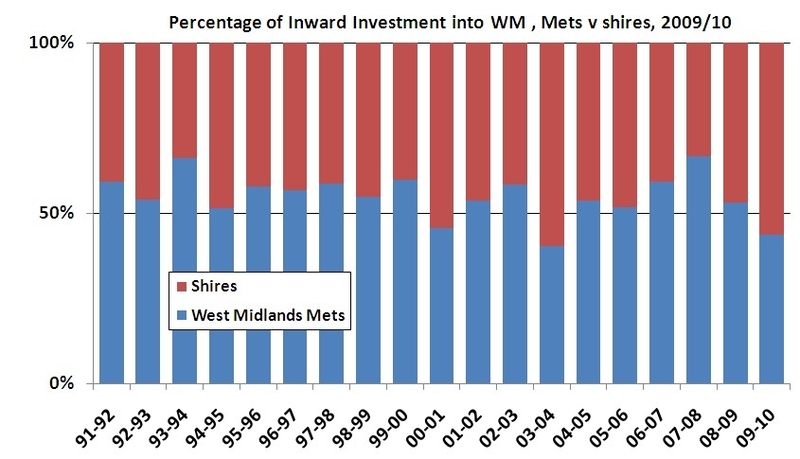 In 2009/10 the shire counties attracted the majority of inward investment projects (55%). See left. However, the metropolitan areas of Birmingham, Coventry, Solihull, Dudley, Sandwell, Walsall and Wolverhampton have attracted perhaps just over half of the projects over the years – see below. The number of jobs created and safeguarded also generally follows a similar pattern. This is the second post in a new series of weekly Observatory research updates; there will be one post from a different research team each week. We’re doing this in response to feedback we received in our recent website user survey. Please do get in touch with any feedback. It’s rather a brief update from the Enterprise and Innovation team this month as during April and May we’ve been busy researching and compiling two interesting reports on different aspects of enterprise and employment in the West Midlands. Our first piece of research is focused on uncovering emerging trends and issues related to aspirations of the region’s businesses and what is constraining their growth ambitions. Our initial analysis is drawn from existing data following a scoping exercise to uncover what information sources were available on the topic. This proved particularly challenging; information regarding aspirations and barriers to growth is rather scarce. However, the report will outline a number of findings that we hope partners will find interesting. Our second piece of research looks at trends in employment in the West Midlands using the latest Annual Business Inquiry data. Initially reviewing the performance at a broad sector level, our report compares the trends of the West Midlands against the UK average and other regions. The report also looks at the underlying drivers behind notable headline sector trends, providing in-depth analysis using the most detailed to Standard Industrial Classification (SIC) codes to fully examine what has been driving growth. Using predefined SIC groupings, the research looks at the recent trends in employment, the research looks at the recent trends in employment of high tech and knowledge intensive industries and Advantage West Midlands’ clusters. We also explore the breakdown of employment demographics. We’ll publish these reports on the Observatory’s enterprise and innovation research pages in the coming weeks. The 2009 R&D Scoreboard, produced by the Department for Business, Innovation and Skills, examines the research and development spending of 1,000 UK companies. Dubbed the UK1000, these are the businesses which invested the largest amounts in R&D. The Scoreboard does not measure total research and development spending, merely the biggest investors, so some substantial businesses (not to mention the wider business population) are not captured in the figures. 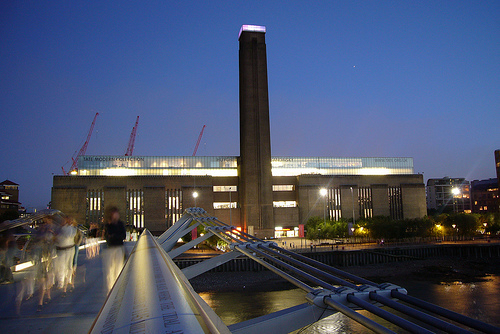 The Scoreboard also considers the top 1,000 companies globally (G1000), which includes only a subset of the UK1000, in order to make international comparisons. The Regional Skills Assessment for 2009 is now available. This extensive research gives an overview of the changing needs of the West Midlands’ labour market, along with a detailed exploration of key issues by sector, by sub-region and for key groups. This year’s main report presents a few distinctive sections compared to previous years. It mainly focuses on recent trends, looking also at the impact of recession and prospects for recovery. The main report is complemented by two reports identifying the main skills needs and issues in each of the region’s key sectors and clusters. In addition, there’s an entire chapter dedicated to future prospects in the region’s labour market with forecasts covering both short-​medium term (2009 to 2014) and long term (to 2024), using the Observatory’s economic forecasting model.